This awesome photo was taken by Timothy Joseph Elzinga in northern Ontario. 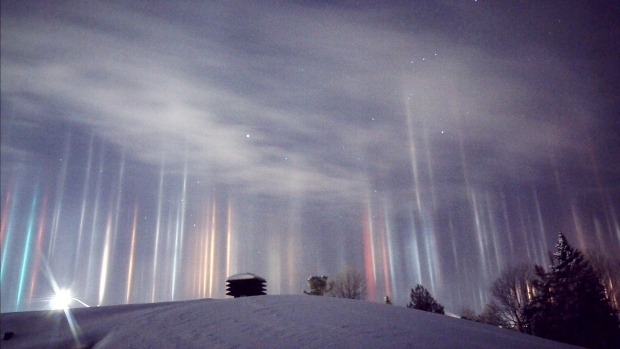 His photo captures a phenomenon called light pillars which appear when light bounces off ice crystals floating close to the ground. Maybe it’s a cover story for aliens who are beaming rays of light down to the earth. XD However it happens, I think it’s awesome! The northern lights are on my bucket list. If I saw this, I’d feel like I was in heaven. Me too JoAnna. to heaven on earth! Wow, it looks like when we squint our eyes. How did you catch this? Thanks. I don’t know. You could contact Timothy who captured this beautiful image via the link in the post. Beautiful photo and yes it is awesome. Thanks. Have you seen this phenomenum live? Not yet but it’s on our bucket list. I love the whimsical nature of your thoughts, the balance between logical scientific explanation and paranormal possibilities. Both are necessary, in my eyes – a desire to understand as well as a desire to just be and absorb everything surrounding us without the need to comprehend. LOL. You give me too much credit Dave. 🙂 But I’ll embrace and celebrate balancing the hemispheres of mind, heart and soul. It is completely awesome, what a sight! Agreed Kirt. Have you ever seen this or the Northern Lights in person? I have never seen this, but did see the northern lights as a kid and still remember it vividly!! Wonderful! I’d love to see either in person. Incredibly beautiful, Brad! Thanks for sharing 🙂 Hope you are well! Thanks Lorrie. I’m surviving or maybe getting close to breakthrough? 🙂 How about you? I love your words! “beams raining from the heavens” is such a stunning image. Each time I have been lucky enough to witness the Northern Lights, it has been a truly Otherworldly experience. I hear music in them so for me it’s like the heavens is raining beams of light and sound, truly awesome and humbling to feel connected to their beauty. Shiny heart indeed! Thank you Laura. The photo inspired me, but I would love to see them live as you have. I love your description as other-worldly and hearing the music of the heavens. It is quite an experience alright. I hope you get to soon- perhaps this year! Iceland is one of the most amazing places I’ve been to, really recommend going there to try see them if you can!